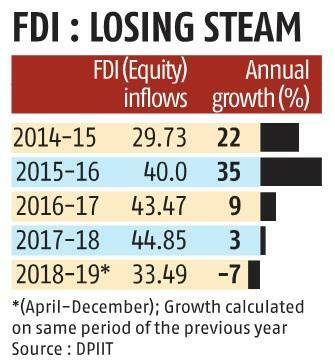 Brought out after a six-month hiatus, the government’s Foreign Direct Investment (FDI) figures have revealed that inbound equity investments dropped for the first time under the current regime, going down by 7 per cent in the April-December period of FY19. Latest figures released by the Department for Prom­otion of Industry and Internal Trade (DPIIT) on Wednesday shows that equity inflows reduced to $33.5 billion over the period, down from almost $36 billion in the same period of the previous year. The latest figures were released after a hiatus of six months, throughout which the DPIIT did not publish FDI figures, despite the Reserve Bank of India (RBI) providing it with regular inputs. This was a major break from the established practice, since this data was published every quarter earlier. The DPIIT compiles total investment inflows with data from the RBI as well as its own databases. The last time they published this data was in August last year — for the April-June period. Officials refused to explain why the data had not been released till now, despite the RBI continuing to release its own quarterly and monthly estimates. The lack of figures had raised questions from credit ratings agencies, private equity firms, as well as banks. Government agencies, such as Invest India and the India Brad Equity Foundation, which are often the first point of contact between the government and foreign investors, have also not received the latest figures. India’s position as an attractive FDI destination has fallen for the first time in 2018. According to the 2018 AT Kearney Foreign Direct Inves­tment Confidence Ind­ex, India is not among the top 10 destinations for FDI. After rising for the past two years, India’s position fell three places in 2018-11. But despite losing its status among the top 10 for the first time since 2015, India rema­ined the second-highest eme­rging mar­ket (EM). The lack of detailed data has also raised questions on the origin of funds. Figures presented by the government to Parliament last year sho­wed that FDI from nations wid­ely regarded as tax havens such as Cayman Islands and Hong Kong had jumped in 2017-18. While the services sector remained the largest recipient of FDI, other major sectors such as telecommunications and computer software saw steep decline. Total FDI inflows, including reinvested earnings and other capital flows, in the April-December period of 2018-19 was $46.62 billion. 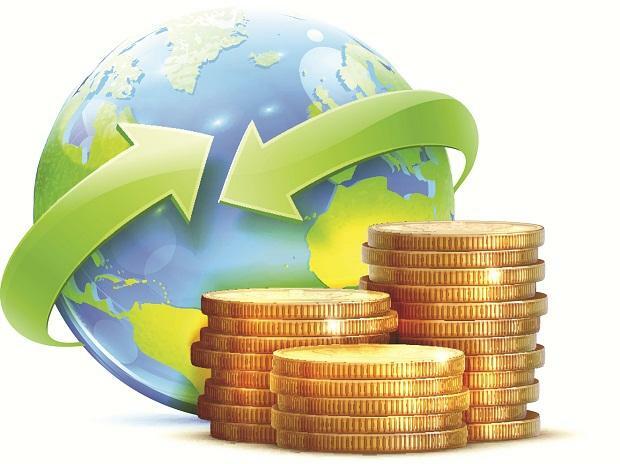 Annual growth rate of total FDI inflows have reduced from 25 per cent in 2014-15 to only 1 percent in 2017-18.